New from Esterline Racal Acoustics (ERA) and just launched at the AUSA Exposition, the RA6000 Press-To-Talk (PTT) System, named TALON, is an advanced and ergonomically designed four channel PTT unit which provides simple connectivity to multiple communication sources. 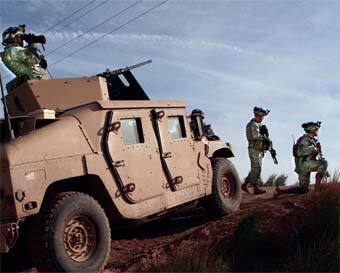 Talon is a valuable asset for mounted and dismounted operators alike, allowing soldiers to continuously monitor up to four communication channels simultaneously, typically two Soldier Radios, plus platform intercom and platform radio, selectively transmitting on them via four ergonomic and intuitive PTT buttons. Clear communications is a key attribute for operational soldiers in all mission profiles, the ability to understand critical information is vital, including the detection of changes in the local operational environment. Talon provides Enhanced Intelligibility via its communications volume level control, and is more convenient to use than accessing the radio controls directly, since these devices maybe belt or backpack mounted. Enhanced Situational Awareness is also supported in the form of Talk-Through (TT), which ensures the soldiers’ natural auditory perception is maintained or enhanced by an adjustable gain control. An Active Noise Limiter protects the soldier against acoustic shock through unexpected high audio volume radio communications, and against sudden acoustic shocks from weapons or explosions when using the Talk-Through feature. The limiter compresses the audio signals to a safe level, while the quality of the sound is not affected. Hearing Protection is an essential requirement, with Talon providing total flexibility by supporting circumaural, in-the-ear, low noise and covert headsets types, allowing soldiers to select the most appropriate headset to protect their hearing in the mission noise profile – which may include impulse noise from weapons and IEDs, and continuous vehicle or aircraft noise. The headset capability is automatically detected, with Active Noise Reduction (ANR), Talk-Through (TT) and Monaural or Binaural (one channel in each ear) communications supported accordingly. With the increasing adoption of communication equipment, including personal radios, soldiers are challenged by the need to continuously monitor and transmit on multiple nets. Compatibility issues between differing radio equipment and different types of audio headset can often necessitate the need to carry multiple headsets and handsets. Shortcomings in common PTT systems don’t allow the soldier to connect to multiple radio sources, and while it may be possible to disconnect the headset from one radio and connect it to another, the loss of any communication channel is undesirable. But carrying additional headsets and handsets increases the soldiers’ weight burden, and is not ergonomic. Constructed from durable robust military grade materials for reliable use in harsh environments, Talon is ergonomically shaped, compact and extremely lightweight. The intuitive user interface is simple to use, with large tactile PTT buttons, compatible and comfortable for Left and Right handed use without conversion, and functional with gloved hands. Weight on the soldier is always an important factor, and batteries continue to be a major consideration, particularly when enough spare batteries have to be carried to last the duration of the mission. Standardisation of batteries, with the disposable AA cell emerging as the preferred choice due to global availability and cost considerations, helps to make a big difference to the weight burden. Requiring only one standard AA cell, Talon is extremely power-efficient with over a hundred hours of operation, more than enough for even the most demanding missions. This enables the product to be very compact and low weight, while power efficiency removes the need to carry additional weight in spare battery provisions. Moreover, the internal AA battery isn’t used or required at all if any of the three attached communication devices can provide a power source. Talon operates over a wide supply voltage range, while very low power consumption has an insignificant effect on power budgets. Alternatively, the product could be powered from centralised or conformal batteries that the future soldier may be wearing. Another innovative and essential feature is its ability to maintain a communications channel, even in the complete absence of a power source – through a built-in Fail-Safe mode. Mission profiles increasingly see dismounted soldiers being transported by ground or air based platforms, and mounted soldiers dismounting, and the need for constant communication in these scenarios proves problematic due to the diverse range of communication equipment deployed. That’s where ERA and its design and market expertise step in. ERA has excelled in recent years in understanding the market requirements and developing market leading products that deliver real, practical benefits to users worldwide. ERA’s ability to do this has seen significant early adoption of all of its recent product developments, with the interest continuing to build day by day. In the dismounted arena, ERA’s lightweight Cobra and in-ear Frontier headsets are already well established in the field, while for mounted applications, the Raptor Circumaural headset family is well proven. Not only has Talon been designed for use with all of these headsets, but it also brings its enhanced features to these products. For example – with an appropriate headset connected via Talon to a platform intercom in a mounted role, Active Noise Reduction (ANR) is automatically enabled, but for enhanced hearing protection the ANR can continue to operate from the internal AA battery while the soldier is dismounting the noisy platform. Situational Awareness is controlled centrally from the PTT unit, rather than on the headset earshell, which improves the ergonomics’ experience and removes more weight from the soldiers’ head.